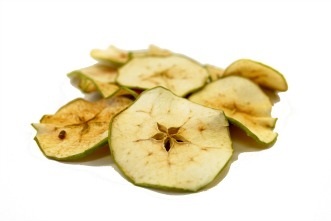 Like biting into a fresh and cool apple, packed with the flavor of a Granny Smith green apple! These crisps are an ideal alternative to sweets. With their satisfying crunch, these apples will have you snacking healthy sooner than you think. If not already satisfying on their own, enjoy them with peanut butter, jellies, jams and desserts. NUTRITION FACTS nutrition facts serv. size (10g), serving per bag (4), amount per serving: calories 35, fat cal. 0, total fat 0g (0% dv), sat. fat 0g (0% dv), trans fat 0g, cholest. 0mg (0% dv), sodium 0mg (0% dv), total carb. 9g (3% dv), fiber 2g (8% dv), sugars 7g, protein 0g, vitamin a (0% dv), vitamin c (2% dv), calcium (0% dv), iron (0% dv). percent daily values are based on a 2,000 calorie diet.